It’s the third stormy day in a row, the kids are getting antsy, and you’ve had enough of the McDonald’s play place for one week. With rainy days come many challenges for young kids: how to have fun and spend productive time without screens or resorting to fast food play places. However, the weather can be a great way to connect with your children and teach them something new! Does your child know why it rains? Or what happens to clouds as they prepare to send drops our way? Instead of trying to avoid the weather and seeing it as a detriment to a fun day, use the weather to your advantage with these three activities. There is something invigorating about being outside during a storm. 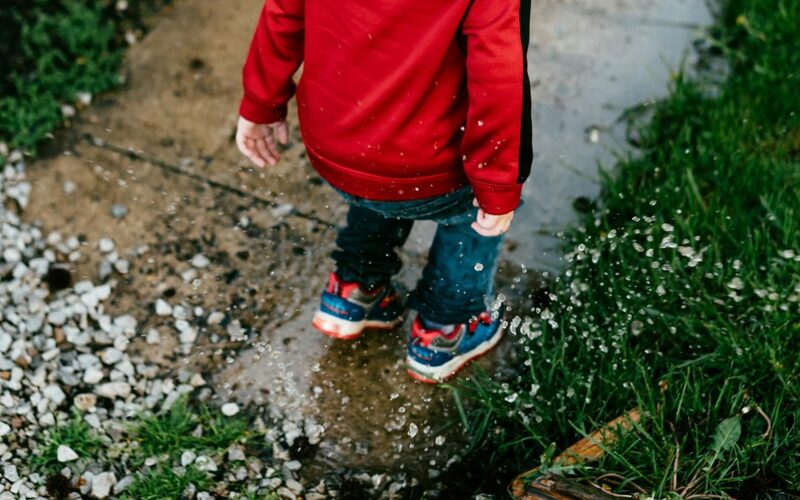 With rain that isn’t too intense, it can serve as the perfect opportunity to jump in puddles and romp around to get some energy out. So grab the rain boots and coats and jump outside! While they’re splashing around, you might be able to point out the “wildlife” that comes out during the rain- worms, frogs, and certain birds (looking for those little worms)! With a large mouth jar, ruler, and glass measuring cup, you have all you need to make a fun rain gauge that can be used for tracking how much rain falls every day during the rainy season. You can place your jar on your front porch, garden, or anywhere else that will be stable for the jar. Then each day after a storm, you can use the ruler to measure how much water fell during that time- 2 inches? 5 inches? Explain to your kids how some storms mean more rain, while a sprinkle may result in very little rainfall. Are you at a loss for words explain to your children exactly how it rains? Use this simple experiment to demonstrate just how it works: pour boiling hot water in a large glass jar without a lid (adult hands only), then place a paper plate or bowl on top of the opening facing up, and wait a few minutes. Then place a handful of ice on the plate or inside the bowl. Then watch as the jar begins to precipitate and “rain” droplets form underneath the plate, falling into the jar. This experiment mimics what “happens” in the atmosphere as warm, moist air rises and meets colder temperatures high in the atmosphere. Water vapor condenses and forms precipitation that falls to the Earth as rain, sleet, hail, or snow. The winter season is upon us, along with the rainy and cold weather that comes with it. You and your family’s enjoyment of this season is possible, turning grey, dreary days into a learning opportunity. With these tips, your children will start looking forward to those rainy days ahead. Looking for childcare for your curious kiddo? Take a tour of the newly opened Fusion Preschool in Plumas Lake!